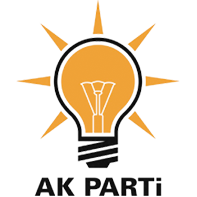 The Justice and Development Party (AK Parti) was founded on August 14, 2001 by reformist cadres of the Virtue Party, which included Recep Tayyip Erdoğan, Abdullah Gül and Bülent Arınç. Within the turbulent political spectrum of early 2000's, the party managed to bring together both conservative and liberal agendas and cadres of Turkish right politics. The AK Party has included members from various political parties and views both during foundation and subsequent period. The party achieved great success in the 2002 elections by receiving 36 percent of the votes, and managed to form a single party government backed by a strong parliamentary majority after a troubled 10 year-long coalition period as only two parties managed to pass the national threshold. In 2007 and 2011, the party increased its votes to a respective 46.5 and 49.8 percent, due to economic recovery and political stability. The current party leader and Prime Minister Ahmet Davutoğlu is the second chairperson of the party. Erdoğan has said the party falls within category of conservative democracy in political spectrum. According to the party codes, its abbreviation is AK Party. Its logo is an orange and black lamp. Justice and Development Party has won every election it participated so far.